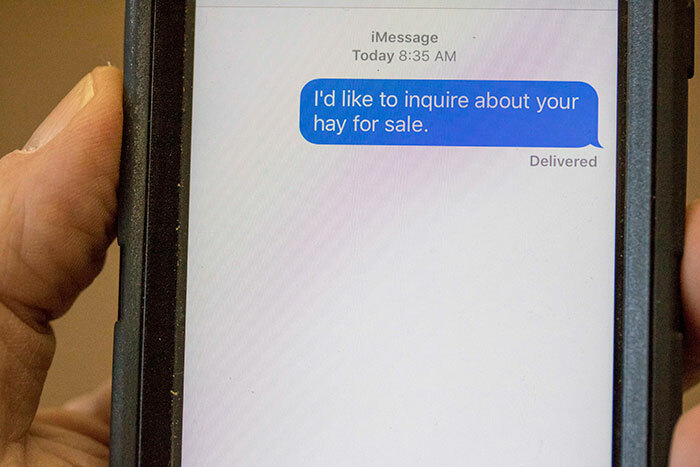 That text message from a prospective hay buyer may not be what you were anticipating. Last week, the Texas Department of Agriculture (TDA) issued a news release warning about a scam being run against individuals who have hay for sale. Apparently, the TDA has received alerts from at least two counties regarding phone scammers who are contacting potential hay sellers. A potential buyer sends a text message to a seller requesting hay; after a price is set, the scammer sends a check for double the agreed upon price with the explanation that the additional money is for shipping costs or taxes. The scammer then asks the hay seller to wire the difference back to them. The seller then wires the money to the buyer, only to learn later that the buyer’s (scammer’s) check bounces. The hay seller is then left to pay the money back to the bank. Similar types of scams are also being reported in other states. In fact, the original text message did not originate from Texas. Apparently, the scammers pulled phone numbers from “Hay Hotline” listings. Anyone who feels they are being scammed needs to contact their local law enforcement and file a complaint with the Federal Trade Commission.